Lionel Fastrack Anna's Siding Fastrack Track Layout with Switches Bulk Track Pack O Gauge Lionel Track Pack Just in time for Christmas or everyday - the perfect solution to putting your Lionel Trains (or your MTH Trains) under your tree or in your man/woman cave. 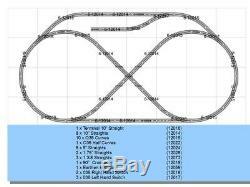 This complete track set will allow you create this detailed layout shown. No additional track is required. 8 x 10 Straight (6-12014). 10 x 036 Curve (6-12015). 1 x 036 Half Curve (6-12022). 6 x 5 Straights (6-12024). 2 x 1.75 Straight (6-12026). 3 x 1 3/8 Straight (6-12073). 1 x 90° Crossover (6-12019). 1 x Earthen Bumper (6-12059). 3 x 036 LH Switch (6-12017). 2 x 036 RH Switch (6-12018). 1 x Terminal 10 (6-12016). THIS COMES BULK PACKED from Hobbyspeed. Dimensions assembled: 4' x8' (see photo's for size). Will run your Lionel, Kline, MTH, Weaver, MDK, or any O/O27 trains! And receive our final invoice to pay. All items must be paid within 7 days. The item "LIONEL FASTRACK ANNA'S SIDING TRACK LAYOUT train pack 4X8' O GAUGE fast NEW" is in sale since Saturday, August 12, 2017. This item is in the category "Toys & Hobbies\Model Railroads & Trains\O Scale\Other O Scale". The seller is "hobbyspeed" and is located in Indiana, Pennsylvania. This item can be shipped worldwide.